The tournament began with host nation Australia defeating Argentina 24–8 at Telstra Stadium in Sydney. Australia went on to defeat New Zealand 22–10 in the semifinal, to play England in the final. 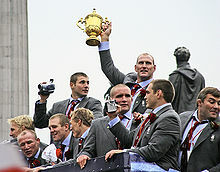 Along with a try to Jason Robinson, Jonny Wilkinson kicked four penalties and then a drop-goal in extra time to win the game 20–17 for England, who became the first northern hemisphere team to win the Webb Ellis Cup. The overall stadium capacity was 421,311 across 11 venues. This was a reduction from the 1999 Rugby World Cup in Wales (with games also held in England, France, Ireland, Northern Ireland and Scotland) which had a total capacity of 654,677 across 18 venues. The Adelaide Oval underwent a AU$20 million redevelopment for the 2003 Rugby World Cup, financed entirely by the South Australian Cricket Association, with two new grandstands built adjacent to the Victor Richardson Gates. 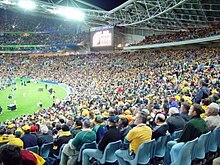 Suncorp Stadium in Brisbane (formerly Lang Park) was a new A$280 million venue designed specifically for rugby league, rugby union and soccer, and was opened just prior to the start of the 2003 World Cup with a capacity of 52,500, some 12,000 more than the old Lang Park could hold. The Central Coast Stadium was also a newly built rectangular venue built for union, league and soccer. It was built on the site of the old Grahame Park ground and was opened in February 2000 at a cost of A$30 million. The Sydney Football Stadium was one of two venues in Sydney that were used for football during the 2000 Olympic Games. The other venue in Sydney was Stadium Australia, which was the centrepiece of the 2000 Olympic Games. By 2003 Stadium Australia was known as Telstra Stadium. It was built as the main stadium of the 2000 Olympics at a cost of $690 million and with a capacity of 83,500 was the biggest stadium used in the 2003 World Cup (the stadium had an original capacity of 110,000 before undergoing a post-Olympics redevelopment from 2001-2003). The only stadium with a retractable roof used was the Docklands Stadium in Melbourne. Although the Docklands Stadium has movable seating which brings four sections of the lower bowl forward by 18 metres to create a more rectangular surround for the pitch, this was not used during the World Cup as it reduces the seating capacity of the stadium by approximately 3,500. In the event, the pool stage of the competition played out largely as expected, with some tension as to whether some of the "developing" nations would overtake some of the weaker major countries for the second quarter-final qualification place in each pool – in pool A, Argentina lost to Ireland by only one point, which would otherwise have carried them into the quarter-finals in Ireland's place; similarly in pool B Fiji lost to Scotland by only two points, while Italy put up a good performance in pool D. In pool C, Samoa gave England a fright with an adventurous approach that allowed them to take an early lead, however, but England overcame the early deficit and won. This match was marked by controversy, as England fielded 16 players at one point during the game. The big clashes ran mainly to form. South Africa came through the pool in second place, after they lost to England, which meant a quarter final against New Zealand. Australia however only beat Ireland by one point to top their pool, whilst Wales pushed the All Blacks to the wire, after adopting an outgoing style of play with a fringe selection. France beat Scotland to round out the quarter-finals. The quarter-final stage produced the widely predicted set of semi-finalists, although England again made heavy weather of defeating a resurgent Wales. England were widely rated the world's best team, but they struggled, at least in the first half, against a Welsh side full of belief after their game against New Zealand: although England pulled away in the second half after the tactical substitution of Catt for Tindall, a late Welsh try gave the scoreline the respectability that their first-half performance had deserved. France destroyed an Irish side who had gone into the match hopeful of a win, scoring 31 early points to put the game out of reach. In the other quarter-finals, a disappointing South Africa fell to New Zealand and Australia defeated the Scots. The first semi-final produced an upset, when Australia defeated the fancied New Zealand to become the first defending champions to reach the following championship final. Unfortunately, it was probably the last match for Australian star Ben Darwin, who injured his neck in a scrum. Although Darwin never played rugby again, the actions of Kees Meeuws – who immediately stopped exerting pressure when he heard the call "neck neck neck" – may well have saved his opponent's life and certainly prevented further injury. The match was decided by a Stirling Mortlock interception try, after a loose pass from highly rated All Blacks fly-half Carlos Spencer. George Gregan taunted his opponents in defeat with the comment, "Four more years boys, four more years". The second semi-final saw France face England. The boot of Jonny Wilkinson was the difference between the two sides, with England coming out victors in torrential rain: although France scored the game's only try after an early English line-out error, they never seriously threatened the English line otherwise. And with handling being difficult in the wet and windy conditions, England's superior forward pressure and territorial control forced France to concede a slew of penalties, of which Wilkinson kicked five, also adding three drop goals (two off his less-favoured right boot) - a remarkable display considering that the swirling winds made accurate kicking as difficult as the rain and mud made passing and running. Three days after the final, the World Cup winning England team landed at Heathrow Airport in the early hours of the morning, emerging from their plane to a huge reception, despite the time. On 8 December, a national day of celebration took place in the form of a massive victory parade in the streets of London. Largest winning margin in Rugby World Cup history. The following table shows the team's results in major statistical categories. No teams were shown a red card during the tournament. ^ "New Zealand loses Cup status", BBC, 8 March 2002. ^ "NZ loses Rugby World Cup", BBC, 18 April 2002. ^ "The whistlers that contol the cup". www.nzherald.co.nz. 2 October 2003. Retrieved 11 February 2018. ^ "England rugby heroes arrive home". BBC Sport (British Broadcasting Corporation). 25 November 2003. Retrieved 7 June 2006.